Bernini Design manufactures units for automatic control motor pumps for irrigation. 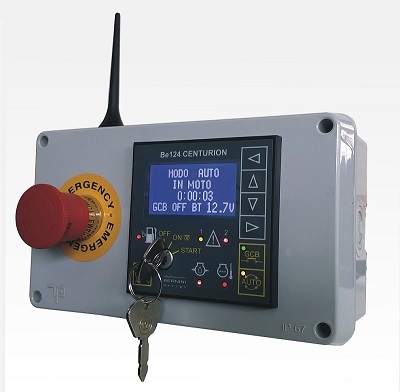 The Be124 MP-GSM control panel is the ideal choice for standard diesel engines and SAE J1939-compliant engines equipped with CANbus (Perkins - Deere - Volvo - Scania Iveco - etc .). Even the box is rated IP65, all internal components are fully coated. This protects the modules against the elements and guarantee long-term operation. The basic version is BE124 - MP. The version BE124 - MP - GSM allows control of the diesel water pump set by means of simple SMS commands. THE SYSTEM USES SIMPLE SYNTAX COMMANDS. YOU CAN FIND BELOW THE MOST COMMON SMS COMMANDS. IN THE USER MANUAL YOU WILL FIND ALL COMMANDS TO LOG-IN, LOG-OUT, READ INSTRUMENTS AND MUCH MORE. It starts the engine of the pump set. It stops the engine followed by an engine start. It sends a request to read all engine instruments. It sends a request to read the status of the engine & mode of operation. It clears a warning or it cancels a shutdown. You force the OFF mode of operation for the pump set. You can connect the Be124 MP GSM by using 6,3X0.8mm FASTON. The internal board contains all necessary blade terminals and fuses for the protection. Inside you will find the power relay already wired. By correctly connecting the panel you can use engine with 12V or 24V battery. The control unit allows the reading of engine rotational speed by means of a magnetic pick-up or by means of the ' W ' terminal available in some belt-driven charging alternator. You can use digital sensors (pressure switch, temperature switch, level switch, etc. ) or you can use analog sensors. In this case you can read oil pressure in BAR, temperature in ° C and diesel fuel level in%. Thanks to the wide calibration range ot the Be124 controller, you are allowed to use type of sensor. For the protection of the pump (Low-High pressure) you can use and analog sensors ( 4-20 mA ), or on-off pressure switches. The terminals  and  are reserved for the measurement of the rotational speed of the engine. If the pickup is not available, it is possible to connect the 'W' of the belt alternator. You can set up an over speed protection limit. The terminals  and  are connected to the 4-20mA pressure transmitter. The controller accepts a full-scale up to 50 Bar. You can set up alarms for high & low water pressure to protect your pump set. If it is not available an analogue transducer, you can connect a safety pressure switch to terminal . To the terminals   and  you are required to connect analog sensors for measuring the oil pressure, engine temperature and fuel level. If analog sensors are not available, you can be configure the inputs for digital devices (ON-OFF). You can set up all alarms to protect your engine preventing severe damage to the engine. The terminals  and  accepts generic digital inputs. The function, or the way to use them, is determined via software. You can connect auxiliary alarms or commands that will automatically start the pump set. The terminals  ...  have to be used to control of the diesel engine. 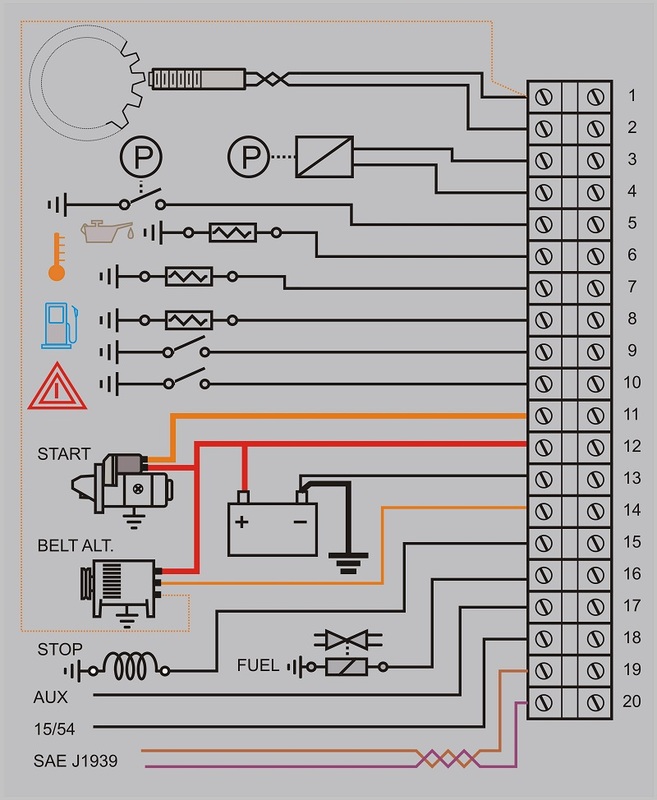 You can set various functions such as stopping time via a solenoid or glow plugs. Many parameters are available for configuration of the automatic start and miscellaneous settings. To the terminal  you can connect an output relay with a programmable function. The terminal 15/54 is connected to the ignition key and it is protected by a 5 amp fuse. You can use it to illuminate your dashboard. The terminals  and  are available for the ECU connection in case you wire an engine with CANBUS (must be compatible with the SAE J1939 standard).